Previously, Subaru has only shown off the chassis design of their new sports car but thanks to Toyota unveiling their version, we have a good idea of what we can expect when the Subaru BRZ is unveiled next month in Frankfurt. The BRZ name alone offers quite a bit of insight into the basic details; with the B standing for Boxer engine, the R standing for Rear wheel drive and the Z standing for zenith – which isn’t quite as clear as the first two. The word zenith is defined as being “the highest point reached by a celestial or other object” so it could be their proclamation at how impressive this new Subaru sports car could be. The Subaru BRZ that will debut in Frankfurt carries the “prologue” addition in the title so it can be presumed that the vehicle that we will see in less than a month is a preproduction or conceptual model. However, with Toyota’s FT-86 having been shown over and over, how much longer will Subaru make the world wait to see the full production version? 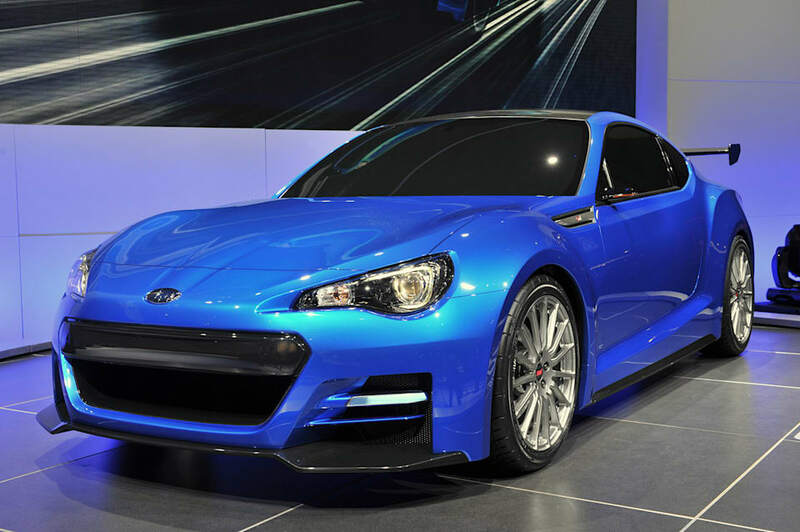 The new BRZ website states that the new Subbie sports car will arrive in the spring of 2012 so we should get a look at the full production version no later than the 2012 Detroit Auto Show – although that is hopeful speculation. 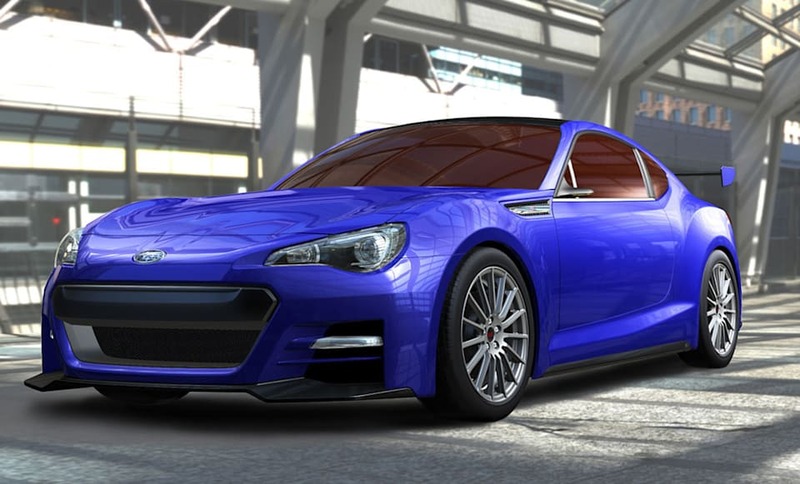 Unfortunately, the Japanese automakers announcement that the Subaru BRZ Prologue would be making its grand debut at the 2011 Frankfurt Motor Show didn’t include any images, although the announcement website (shown above) offers some different renderings of the sleek new Toyota/Subaru joint effort. The Subaru Boxer engine lineup has done a great job making the Subaru WRX and WRX STi models among the most popular Japanese performance models in the US market, so it will be interesting to see how the American consumer responds to a rear wheel drive sports coupe that will have to face competition like the Ford Mustang, the Chevrolet Camaro and the Dodge Challenger – along with other Japanese competition like the Nissan 370Z. sooooo curious to see the design! So, is it going to have the similar turbocharged boxer engine that goes into WRX with RWD? If I get a version, I would get the toyota, unless they subie looks retarded nice. Toyota is local here, I have to drive an hour+ for subaru. So if there was ever a problem or warranty covered issue toyota is right here. I will prob want the subie version more. Toyota ruined their concept. The first iteration was fantastic. The second was the typical Japanese poop they are churning out these days. 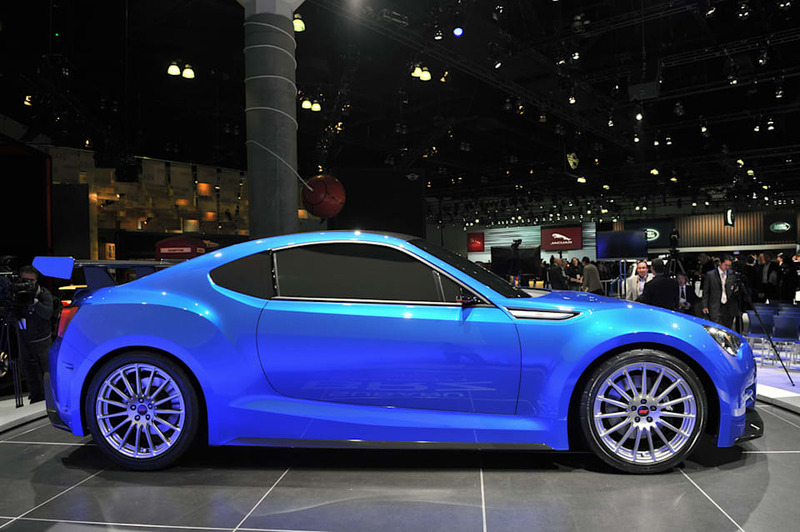 LOS ANGELES, Nov. 1, 2011 /PRNewswire/ -- Subaru of America, Inc. announced today that it will show an all-new concept version of its upcoming BRZ sports car at the 2011 Los Angeles International Auto Show. 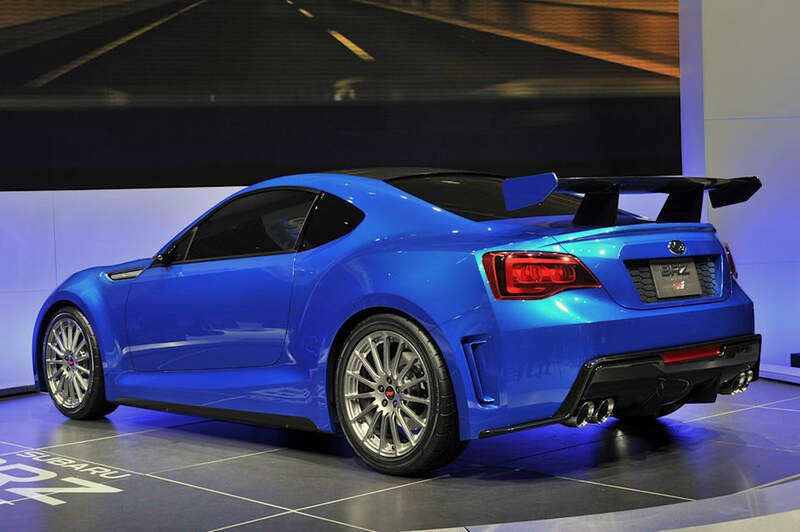 Dubbed the Subaru BRZ Concept- STI, the concept car represents the next step in lightweight performance sports cars combined with the race-bred tuning of Subaru Technica International (STI). 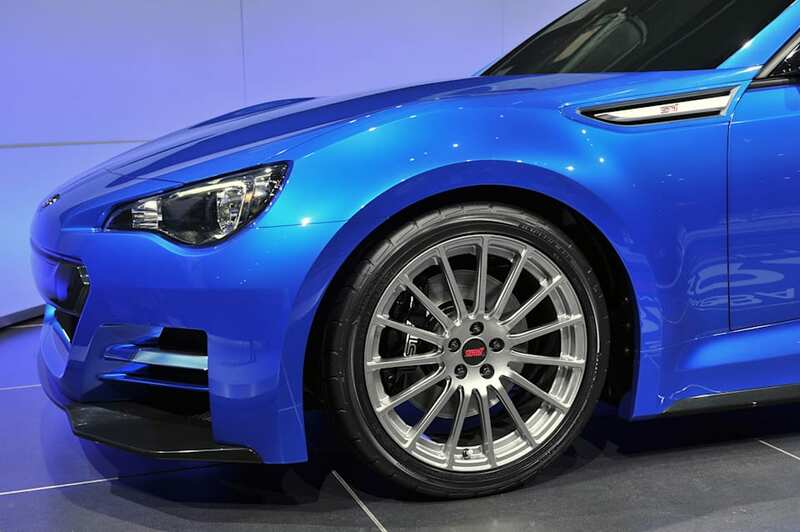 The first BRZ concept car to be shown with bodywork, the Concept – STI strongly hints at the styling of the production BRZ and features unique STI performance features. Sleek, low and tightly coiled bodywork blends with STI performance touches for a sporting profile. A hexagonal front grille, hawk eye headlights and fin-shaped fog lamps are instantly recognizable as Subaru. The exterior colour "WR Blue Pearl II" is a new generation of the iconic WR blue paint scheme that has adorned both racing production STI's. The body is set-off with aero-tuned lower front spoiler and unique rear fascia, a rear wing for added down-force and a carbon-fiber roof to lower its already record setting center of gravity specification. The rear design features bold rear fender flares and large rear-diffuser giving way to polished stainless-steel quad-tailpipes. Vented rear bumper corners contribute to improved aerodynamics performance. 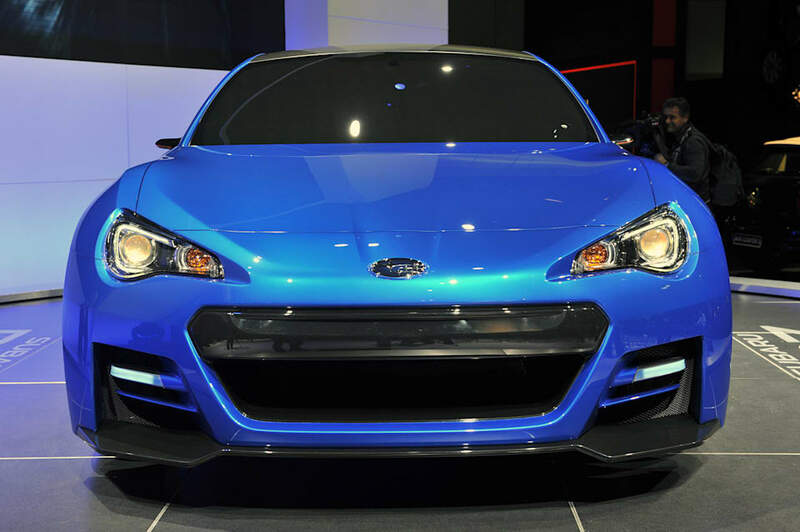 The concept car employs the totally new Subaru "FA" Boxer engine exclusively designed for the RWD BRZ sports car. In order to achieve properties best-suited for the BRZ sports car, the overall structure of this 2.0-liter naturally-aspirated four-cylinder boxer engine has been designed with a square bore and stroke of 86 X 86 mm. The inherent qualities of the Subaru Boxer engine were mated to a direct injection fuel system, which further improves combustion efficiency, running smoothness up to high rpm and high environmental standards. The lightened Concept – STI features an STI-tuned suspension, Brembo brakes and unique 18-inch wheels and tires. The Subaru-engineered and built chassis boasts a rigid frame housing a two-plus-two interior and front engine/rear-wheel drive layout. With the engine mounted low and rearward in the engine compartment to allow for near-perfect balance and one of lowest CoG's of any car on the market. The BRZ Concept – STI is designed to combine lightweight, a low polar moment and razor-sharp reflexes for the ultimate handling machine. The low engine placement also allows for a very low and blade-like hood design. Short front and rear overhangs reduce the yaw moment of inertia. Compared with other Subaru models, which already feature a low centre of gravity and optimal weight distribution, the engine in the Subaru BRZ - STI - sits even lower, 4.7 inches lower in fact and is positioned 9.4 inches closer to the centre of the chassis. 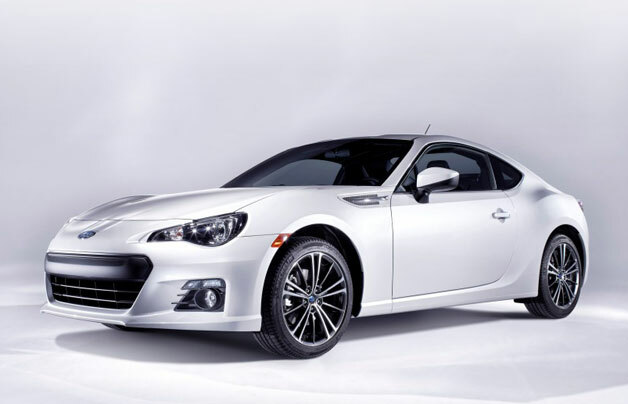 The first RWD Subaru, the production Subaru BRZ will begin production in spring 2012 as the only mass-produced front-engine, Boxer engine rear-wheel drive sports car in the world. Calling it an STI and no turbo or AWD? I think I like the Scion better. I know the SEMA-esque items won't be there in production, but the rear fender, vents, and head/tail lights that stick out don't work for me. Look at the size of that Wing!!! I thought Subaru wanted all their vehicle to be AWD, and all I see is RWD for this new model? I'll get the link a little later from C&D but they were able to drive the prototype of this car. Supposedly Most of the development of the car, engine chassis, etc was mainly developed by subaru. Toyota did more of the design of the car. This should be a total drivers car in the same way the MX-5 is. Loved the way my MX-5 handled. With the insanely low Center of Gravity on this Subaru, light weight, it really should be a VERY fun car. I would be surprised if they did not offer a TRD kit for it at some point soon. Rebranded via Subaru of course. 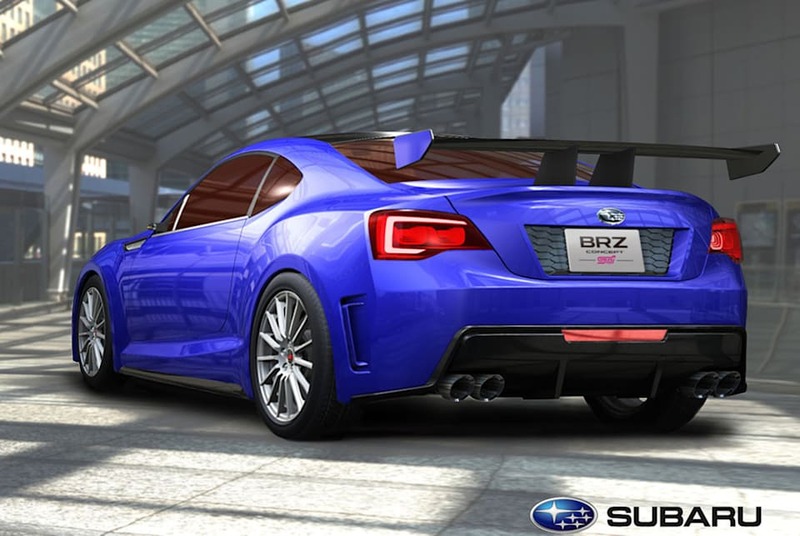 The "SUBARU BRZ CONCEPT - STI -" is a concept car based on the "SUBARU BRZ", an all-new rear-wheel drive (RWD) compact sports car developed from an ongoing joint-project between Subaru and Toyota Motor Corporation. By making full use of the Horizontally-Opposed Boxer, Subaru's core technology, this concept car further pursued a "Pure Handling Delight" driving experience that can be realized by the Boxer engine's low center of gravity. 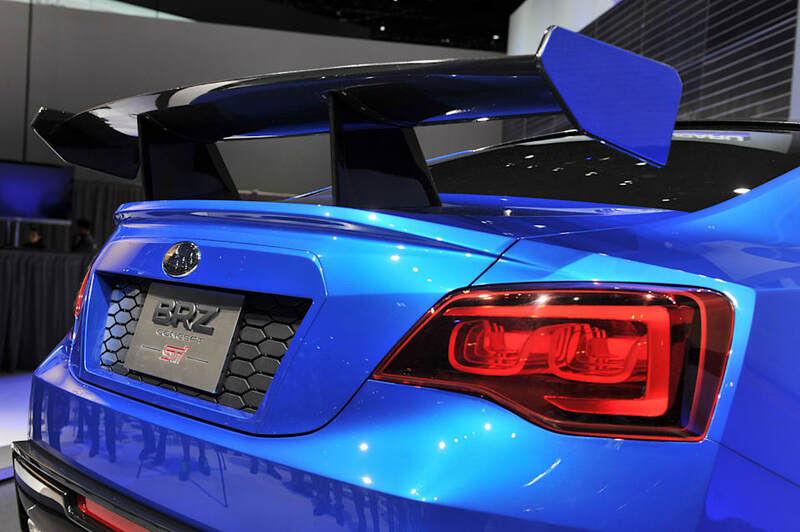 Combined with motifs of Subaru's iconic performance brand "STI", the concept car embodies an ultimate handling performance and symbolizes the possibilities the SUBARU BRZ holds for the future. • The lively exterior color "WR Blue Pearl II" is a new generation of the iconic WR blue paint scheme that emphasizes the racing image. • The engine has been designed with a square bore and stroke of 86 X 86 mm. Combined with Toyota's D-4S direct injection technology (fuel injection system), high output and high environmental standards were both attained, both expected of a new generation sports car. 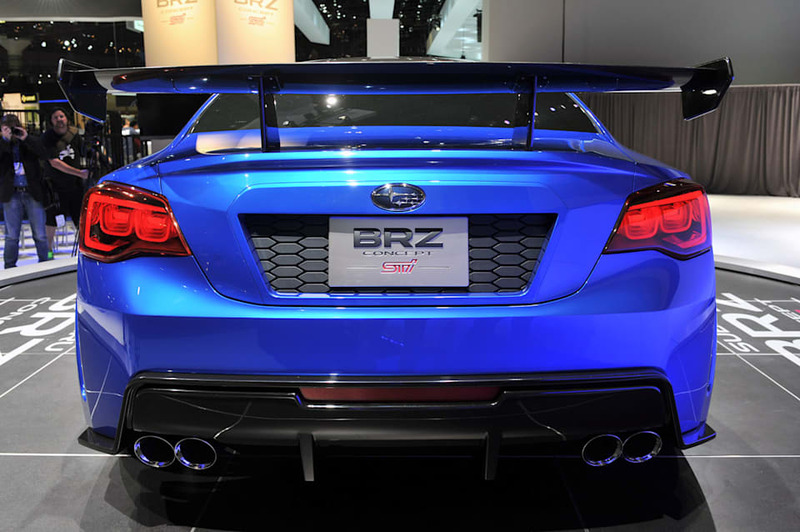 • Compared with other Subaru models, the engine in SUBARU BRZ CONCEPT - STI - sits an impressive 120 mm lower and is positioned 240 mm closer to the center of the chassis. As a result, this car has achieved one of the lowest possible center of gravity in cars on the market today. • By incorporating lightweight parts such as a carbon-fiber roof, the overall weight has been reduced. Subaru has also succeeded in attaining a body structure that is both lightweight and highly rigid in a striking balance. The concept car is the embodiment of pure driving enjoyment only obtainable with a "Boxer sports car". • Its unique handling performance has been remarkably refined by adopting STI's lightweight 18-inch alloy wheels with performance tires and STI tuned suspension with excellent lateral stiffness. Want level increased by 90%! Looks better than the frs. That's for sure. I like the rear, but the front.... No thanks. Looks great, but that wing needs to go. Toyota looks better....but they both need a turbo. One thing that's bugging me with the BRZ is that creased line at the rear quarter panel section, at the top of the fender. Just doesn't look right to me. A turbo DI H4 would be a nice option, and very Subaru-like. But a RWD vehicle isn't Subaru at all. I like this blue also. Another thing to note as to why there is not turbo. Subaru/toyota wanted to keep the weight down as much as they can. Here's one thing I kept reading in all the reviews and I agree somewhat. A car you buy should not be based on lap times. Marketing has ruined cars for that reason. It should be based on a fun to drive factor. Unless your in a competition where lap times matter, the basis of you buying a car should be how big that smile is on your face and not what a time stamp of your lap is. And I totally agree with them. And what I'm taking from all the reviews, this is one hell of a drivers car for the not so rich. Haven't heard one bad thing yet about the drive. BTW - Wasn't the purpose of the platform to be a RWD coupe? Why all the bitching about it not being AWD? It's not like Subie doesn't have any AWD alternatives. Last edited by pttl; 11-20-2011 at 09:13 AM. Not nearly enough horsepower. Maybe there's a TRD package in the works. AWD adds weight, and thats bad for a car meant to handle well. Now unless you live where it snows a lot I understand. But you can get a WRX then. I'm in socal, and AWD is pointless to me. they haven't released hp numbers yet. But it should be a ltl more than the 200 toyota is saying for the FRS. My guess is 230? I'm not sure how much hp you are able to pull out of a NA 2.0 I4. my main concern is that price point being kinda high for a car that seems like it will be the bare bones that is just fun. Last edited by speedemon90; 11-20-2011 at 08:25 PM. Hopefully they'll have a supercharger kit if people want more power. I'd prefer it to a turbo for the sake of throttle response on this kind of car. I like the subtleness more than the FRS in a way? Toyota states that the GT 86's engine will produce 197 bhp and 151 lb-ft of torque. Likewise, Subaru says its version will make a nice, round 200 horsepower and 151 lb-ft. Subaru also revealed a couple of tidbits that Toyota left out, including a svelte curb weight of 2,689 pounds and a standard tire size will be 215/45R17 rubber. wow that is light! Say again? What turbo?? Who needs it when the car is that light! 0-60 will be under 6 I'm guessing, maybe just though.